This contest is not guaranteed because I have no idea if there's even people on Freelancer.com with interior decoration skills. But I have every intention on paying if there's a worthy entry. Luckily, I have no design preference. All I care about is that rooms are unisex and warm / inviting. That's it. I take on emergency / short term foster kids (aged anywhere between 6 and 17, boys or girls). I have two 3x3m bedrooms. They are almost identical - just different positions of the doors. 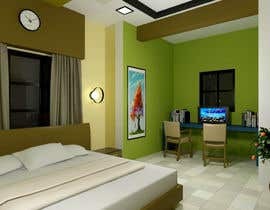 In terms of styling, the rooms will be the same. In terms of object positioning, they will be slightly different due to the different door positions (entry door and built in robe doors). The entry door and built in robe doors open INTO the room. You can't change the dark brown / red floorboards or the cream walls. 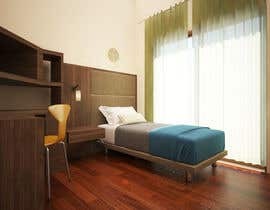 So given those constraints, and that the room needs a single bed and a small desk as a minimum... how would you layout and style the room? Of course, there are plenty of ways to change floors (rugs) and walls (prints / wall decals). 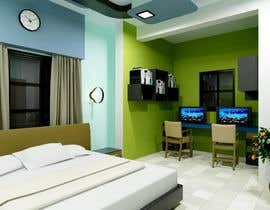 Each room has built-in robes which does NOT take up any of the 3x3m space. So therefore no cupboard / wardrobe is needed. However each room will need ample storage and shelving space. With limited floor space I'm thinking storage drawers under the single bed, and shelving on top of the desk. I'd prefer not to drill into walls to add shelves. The bed head can have shelving to... I'm sure there's plenty of ideas to solve storage / shelving space issues. 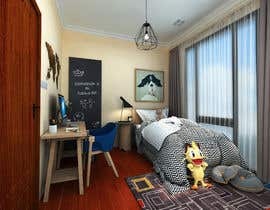 IMPORTANT: I want the room to be unisex.... and I must be able to change the look and feel of the room easily to cater for different aged children. So using chalkboards on the walls, notice boards on the wall so I can pin different fabrics / prints to, using wall decals that can easily be removed / replaced, etc... are all things you should be thinking about. I like, and think it's best to use punk / retro colours as they are unisex and fun. Although keep in mind that I don't have a lot of money to buy customised and hard to find items that appear in the example above. KEY: Each room must be warm, inviting, cozy, safe... and I think clever uses of lighting should be considered. KEY: If it's possible to have a bean bag or something for a "chill" spot to read, etc... that would be great. 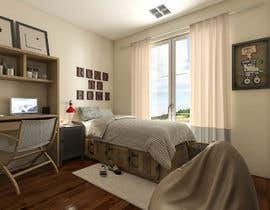 I know the room is small but if we can have 3 spaces - sleep, study, play / chill... that would be great. Note the different positions of the doors and how room1 is probably better because of the positions of the doors. Ignore my positioning of things. I was just testing things out. Room 2 couldn't have a corner desk because of the door configuration? The built in robe doors are not rendering properly in the 3D image. Both doors open inwards. I really don't know why people are submitting designs that ignore the floor plans, or change the wall colours, or simply ignore things in the brief. But you are wasting your time if you submit a design that doesn't even match the floor plan. Firstly, interior decoration jobs are rate on this platform and there's not many people on this platform with those skills. Therefore, there will be very few people submitting designs and I need everyone to see what designs I like to help them understand what I'm trying to achieve. If I knew I'd get 100+ designs submitted then I'd seal the contest. But also... in a logo contest, if the contest holder marks one entry as 5 stars then everyone knows that the contest holder likes that STYLE of logo. In this contest there is NO style that I prefer. All I want is a unisex bedroom that is warm and cozy. Any colour scheme, any layout, any furniture... I don't care. So if I rate a design as 5 stars, it simply means that the design meets the brief. It's not an indication that I like that specific STYLE. I understand your point but for just one reason I wanted it to be sealed. The uniqueness of a work will not remain and people who don't have any idea about this will try posting almost the same work which ruins the hard work and creative thinking capabilities of a person. This is just my point of view. Yeh but I've run lots of contests (mostly on 99designs.com) and if I see a really similar design come in, I ignore it as the earlier submitted design is the "original" concept. Well I'm getting some great entries that meet the brief. So it's certainly possible. Just to confirm with everyone... 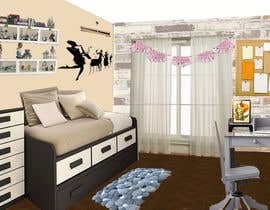 I want a 100% completed interior DECORATION idea that is suitable for boys or girls aged 6 - 17. I will not change the room depending on the child staying. So you need to pick the colour accents / details that will meet that brief and submit a 100% completed design. Just to confirm colours... the roof is white, walls are off white / light cream and all doors are cream. Oh, and there's only one central light in each bedroom so please ensure your entries don't use multiple downlights... the best I can do it replace / lower the central light in each room. But lamps can be used to create the lighting effect you want. I should point out to everyone that this contest is my way to find someone I can work with on doing the other rooms... lounge, rumpus, etc. I've moved into a new place and am spending thousands of dollars on new furniture for every room. So I'm more than happy to pay $180 for this content and then an hourly or fixed price rate to the winner to do the other rooms. no can do. Not enough people will enter this contest for me to guarantee it. It's been open for 2 days and I have one person who has met the brief. This is not a logo contest where I'll get hundreds of entries. Also on the 3D render ignore the way the doors open - I can't get them to render properly. The way the doors open on the 2D floor plan are CORRECT. I've updated the floor plans and 3D image. 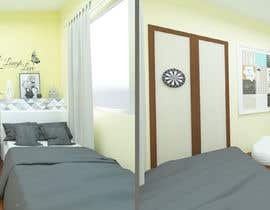 The position of the door in room #2 was wrong. It's in the center of the wall, not the corner... sorry. Can everyone see my comments that I make on a specific design? It's a rental property so I can't really change the built-in-robe doors. I'd much prefer sliding doors but that can't happen. The desk forms part of the bed which is great for saving space. With that last link I posted... imagine in room#2 putting the bed positioned across the window with shelves at either end of the bed... this uses 100% of the floor space, make the window a focus (rather than trying to work around the window when positioning the bed), and results in lots of shelving space and creates a nice area to sit and read as well. In addition, no bed head would be needed. I don't know... I'm no expert but I think it could work. In addition, you could raise the bed and have storage drawers underneath. The windows are West facing so the window doesn't get the morning sun streaming in which could be annoying if the window was facing East. What an uber cool room - don't you just want to hang out in there all day long? 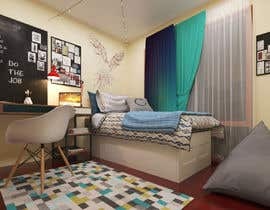 I just want to clarify that this is not a "room layout" and "basic styling" job. I've already worked out the basics of where a bed and desk will go - that's easy. I want someone to make this an uber cool space for young people. The space needs interior DECORATION... whilst taking into account my comments about shelving, etc. 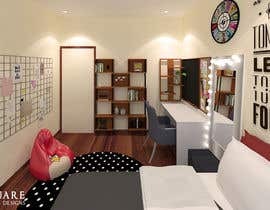 If you google "cool unisex teen bedroom" you'll see they are filled with lots of places to store, display, and hang things, lots of colour, pictures on the wall, and lots of knick-knacks to create interest in the room. 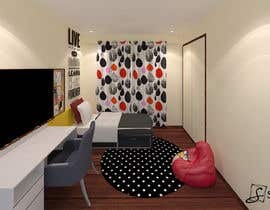 I can easily work out where to put a bed and a desk, and can easily pick a bed-spread that will match the floor and walls. 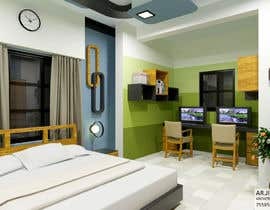 But the result will be a nice, clinical room... not a fun, inviting room full of youthful energy. Just to confirm that these rooms will be used by 6 - 17 year olds, and most like older children (10+). 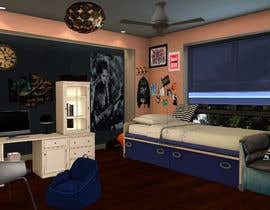 So it'll be best to lean towards a "teen" style room rather than a "little kid" style room. I dont think I will participate in this unguaranteed contest. But you can check my portfolio if you like and give this project as a job. Yeh, I've run lots of contests on 99designs and the like. There's really nothing for interior decoration other than paying $400 per hour for a consultant. There's a very high chance that the quality of entries will be low using Freelancer for this kind of contest, so there's no way I could set it to "guaranteed" on this occasion. At the same time I can't just hire you hourly when there's nothing on your profile (description or feedback) to show interior design skills... you're clearly skilled in architecture though. So, if you want to take the risk of submitting even some basic concepts to this contest, then I can indicate whether I think it's worth you spending more time and in turn getting paid. There's probably not going to be many (any?) other people attempting this contest... not sure. Ok, how can you start working on it without the pics of the room, floor plans, etc? I only just now realised Freelancer removed the links to those resources. I've just uploaded them to the project instead.